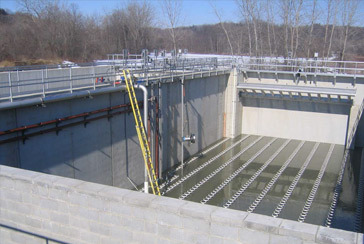 Guilderland Wastewater Treatment Plant - Guilderland, N.Y. The scope of work included modifications to the headwork’s of the plant with replacement of bar screens and grit removal equipment, replacement of existing primary clarifiers with new mechanical equipment, construction of four new SBR tanks with fine bubble diffusers, blowers and associated accessories. Work included demo of existing secondary clarifiers and converting tanks to sludge digesters, modification to existing chlorine contact tanks to allow for installation of UV equipment and new effluent parshall flume. The solids handling process was also upgraded with new thickening tank, gravity belt thickener and solids handling building. Jett Industries is a subsidiary of Kiewit Corporation. This link will direct you to Kiewitjobs.com where you’ll find a comprehensive list of all Kiewit and subsidiary staff opportunities. If you would like to view Jett jobs only, use the search tool to narrow results. Jett Industries Inc. is a subsidiary of Kiewit Corporation. This link will direct you to Kiewitjobs.com where you’ll find a comprehensive list of all Kiewit and subsidiary staff opportunities. If you would like to view Jett jobs only, use the search tool to narrow results. © 2019 Jett Industries Inc. All Rights Reserved.